Where is the closest place for a walk along the beach if you live in or are visiting the Greater Hartford area of Connecticut? It's Hammonasset Beach State Park, the 919-acre Long Island Sound outpost in Madison that is home to a two-mile-long white sandy beach—Connecticut's largest. 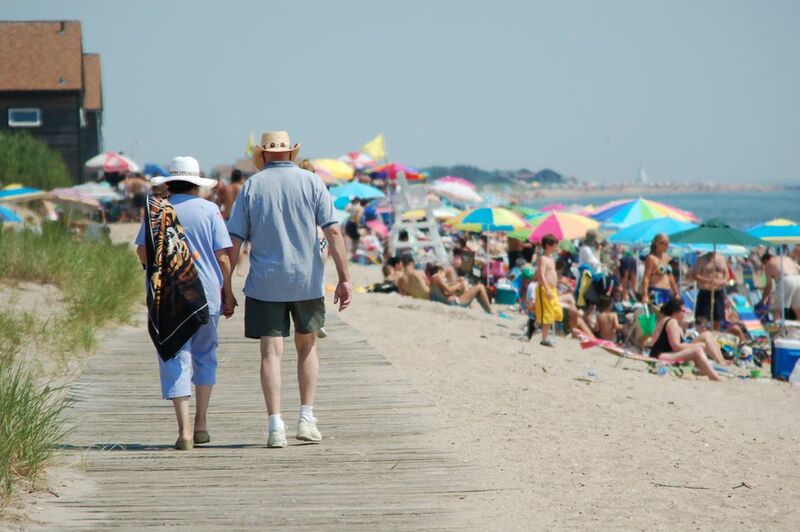 Whether you're longing to jog or stroll along the boardwalk, to lounge on the beach doing nothing more strenuous than tanning or to cool off in the refreshing waves, here is a quick guide to visiting Hammonasset Beach State Park. Directions: Hammonasset Beach State Park is located in Madison, Connecticut. From Route I-95, take exit 62 and follow signs for about one mile south to the beach. GPS Users: 1288 Boston Post Road, Madison, CT, is the physical address for Hammonasset. Hours: Hammonasset Beach is open daily from 8 a.m. until sunset. Admission Fees: For Connecticut residents, parking and admission are free at all times as of 2019. The fee for out-of-state cars is $15 during the week, $22 on weekends. Admission after 4 p.m. is just $7 per car any day for non-residents. There is no fee for anyone to visit the park during the off-season months. Facilities: Restrooms, showers and changing facilities are available. A food concession operates during the summer season, or bring your own food and claim a picnic table. Activities: In addition to swimming, other activities to enjoy at Hammonasset Beach State Park include picnicking, saltwater fishing, hiking, boating and bicycling. For something less taxing, there's always shell collecting and sand castle building. Hammonasset is a very family-friendly beach with gentle surf and lifeguards on duty during the summer season. When you're ready to get out of the sun, visit the Meigs Point Nature Center, which has a touch tank and other exhibits focused on Connecticut's unique wildlife environments. The nature center is open Tuesday through Sunday year-round and also offers a variety of educational programs. Camping: Hammonasset Beach State Park has 558 campsites available. The campsite fee for 2019 is $20 per night for Connecticut residents or $30 for non-residents, plus a reservation processing fee of $9 per reservation. Higher rates are charged for sites with electric and water hook-up ($35 for Connecticut residents, $45 for non-residents). Rustic cabins may be rented for $70 per night ($80 for out-of-staters). For reservations, book online or call toll free, 877-668-CAMP (2267). There is a $3 fee per stay for walk-in registrations at Hammonasset when space is available. Dogs at Hammonasset: Dogs must be leashed at all times and are not allowed on the beach or boardwalk during the summer season. Sorry, Fido. A Bit of History: Hammonasset Beach State Park is named for the Hammonasset tribe of eastern woodland Indians, one of five tribes that inhabited the shoreline area of Connecticut. The Indian word "Hammonasset" means "where we dig holes in the ground," a reference to the tribe's agricultural way of life. In 1919, the Connecticut Park and Forest Commission began to acquire the lands that would comprise Hammonasset Beach State Park. By the end of the year, 565 acres had been purchased at a cost of $130,960. On July 18, 1920, the park opened to the public. About 75,000 people visited the park during its first year. The park nearly doubled in size in 1923 with the acquisition of an additional 339 acres. During World War II, Hammonasset served as an army reservation and aircraft firing range and was closed to the public. It reopened to beach lovers after the war and quickly began to break attendance records. Today, Hammonasset Beach is particularly crowded on summer weekends, but you can always find a spot to spread your blanket and soak up the sun. On mild days in the off-season, it is a great place for a quiet, reflective walk by the sea. While You're in Madison: Fuel up for your beach day at Cristy's Madison, famous for their 40-plus varieties of pancakes; visit independent bookstore R.J. Julia to pick up a beach read; and get your fried seafood fix at The Clam Castle, which has been a summertime tradition for about 60 years. Hawk’s Nest Beach Resort in Old Lyme, Connecticut is family owned.